COMPANY PROFILE Yes Bank Ltd is a commercial bank. The Company provides banking and financial services. Its business segments include Treasury, Corporate/Wholesale Banking, Retail Banking, and Other Banking Operations. Yes Bank Ltd is a full-service commercial bank operating in India. The bank’s activities include corporate banking, financial markets, investment banking, corporate finance, branch banking, business and transaction banking, and wealth management services. A majority of the bank’s earning assets are loans. The bank’s loan portfolio is diversified across various industries, including food and agriculture, life sciences and information technology, tourism, hospitality, media and entertainment, renewable energy, education, and social infrastructure. Services and agriculture constitute approximately half of the bank’s priority sector loans. At the price of INR376.40 as at 16 Jul 2018, Yes Bank Ltd is trading at a Price to Book Ratio of 3.2 times current book value. 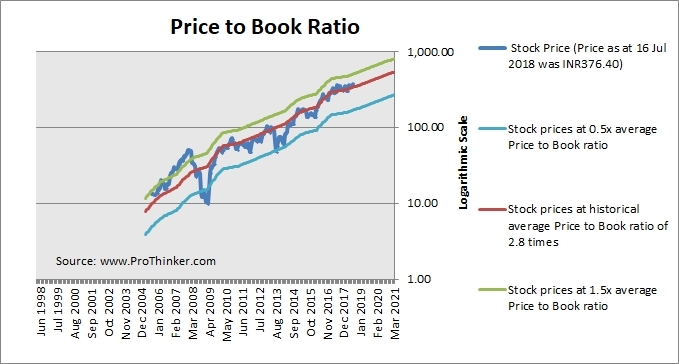 This is a 12% premium to its historical average Price to Book Ratio of 2.8 times.